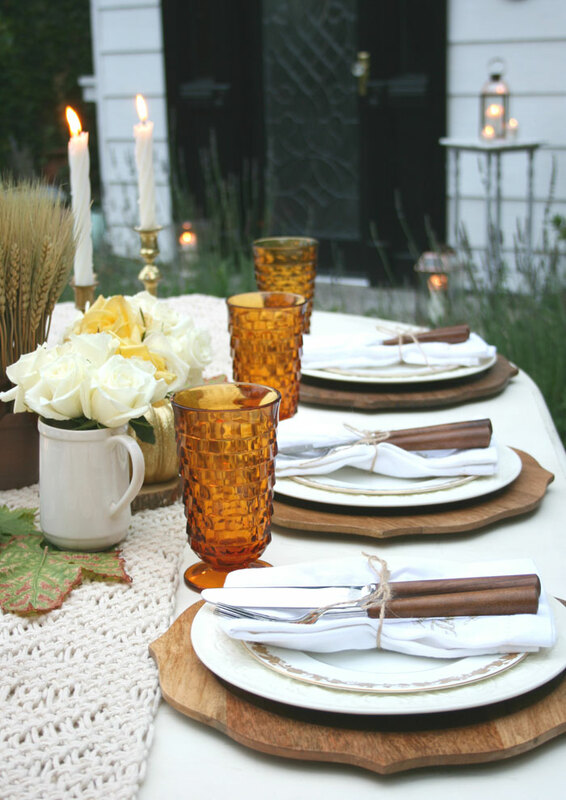 Move the Thanksgiving table outdoors and give guests a cozy alfresco dining experience. The colors of Autumn are balanced nicely at this elegant Thanksgiving table set simply with vintage white Wedgwood china and natural wood accents. Warm weather in some parts of the country often allows for entertaining outdoors in late November. Living in southern California has permitted me to take the party into the yard to celebrate Thanksgiving on many occasions. 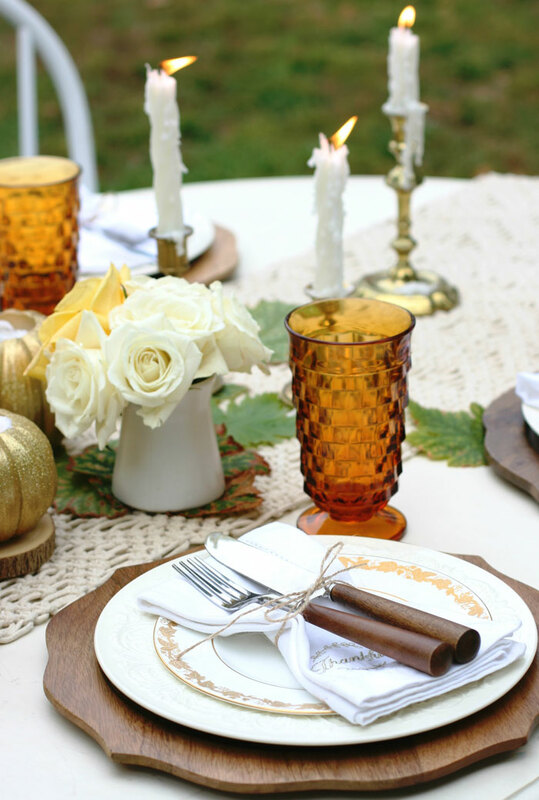 This tablescape proves how easy it is to create an elegant alfresco Thanksgiving experience for your guests to enjoy, and best of all, these table setting basics can easily work indoors as well. 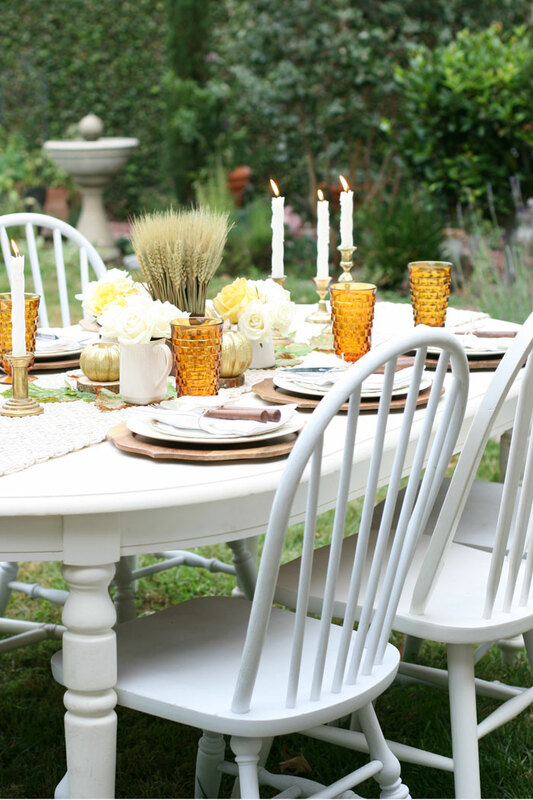 Using Mother Nature’s bounty as your backdrop, position the table in a spot that’s both intimate and pretty. This year our guest list is on the small side, so pulling together a table for six is easy as pie. With a larger gathering, set up several tables near each other and vary the tableware slightly to add interest to the overall look. The key to hosting a successful Thanksgiving gathering is to plan your tablescape a few days ahead. Lay out your plates, glassware, napkins and everything else earlier in the week. On Thanksgiving morning all you’ll need to do is transfer it outdoors. Choosing the right plates for your Thanksgiving table is important because the patterns on your dishes will guide your choices for the rest of the table. In this instance, I wanted to create an elegant dining experience with casual overtones so I chose two subtle patterns of vintage Wedgwood china that work nicely together. Just a hint of gold on the salad plates offers the perfect seasonal accent and contributes a little sparkle to the fall color palette. On this important holiday, two patterns of vintage Wedgwood china set the tone for an elegant dining experience. 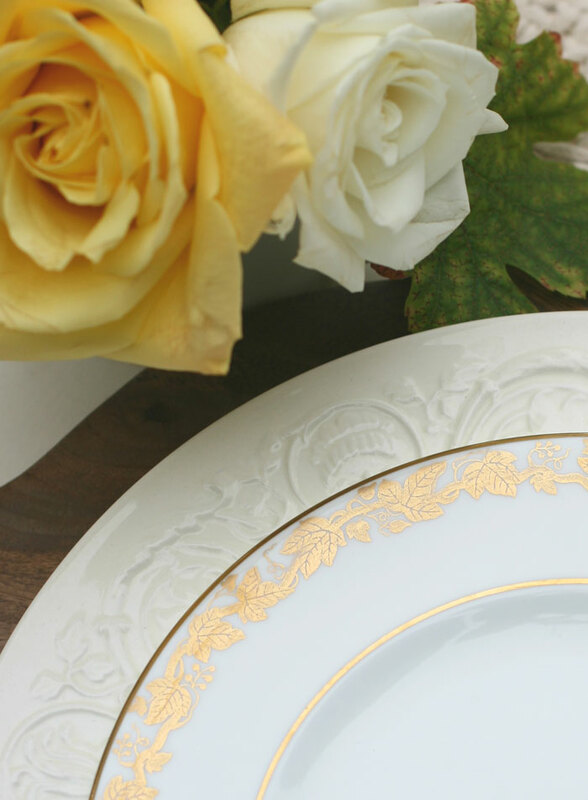 Accents of gold on the salad plates coordinate beautifully with the brass candlesticks and yellow roses. It wouldn’t be Thanksgiving without a little hint of autumn décor, but we don’t want to overdo it with turkey figurines and brightly colored pumpkins. For this table, a pot filled with natural dried wheat, multicolored grape leaves harvested from the garden and a few glittery pumpkins are all that’s needed to add that Thanksgiving flair. Natural wood in the forms of cutlery and charger plates add another fall-like element to the table and contrasts nicely with the white table. 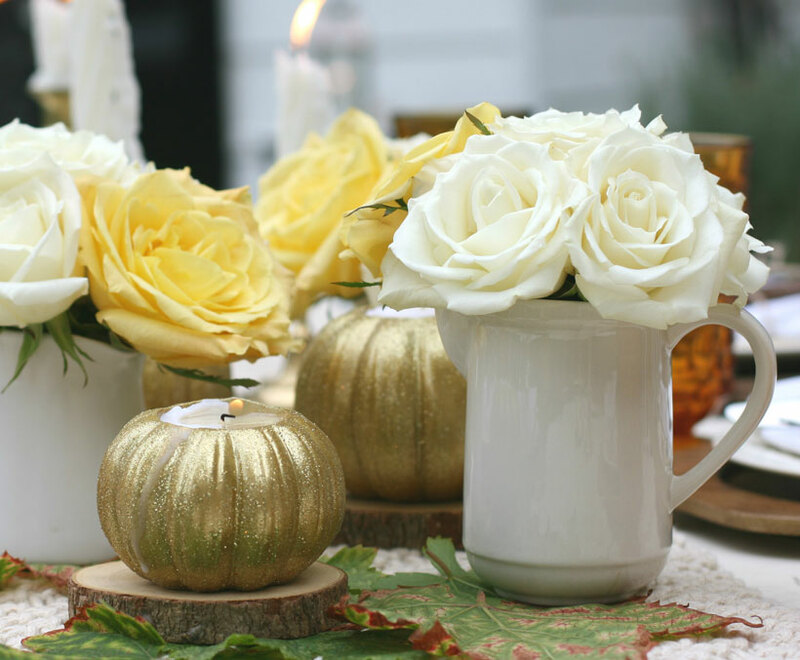 A trio of ironstone creamers holds white and yellow roses while glittery pumpkins and fall leaves remind us that it’s Thanksgiving. Simple, low-profile arrangements at the center of the table keep the conversation flowing. Nothing can duplicate the magic of candlelight. Tiny flames flickering at table add the perfect dose of mystery and romance, not to mention candlelight makes everyone look more attractive! Brass candlesticks are the choice at this table, but votives, small lanterns and hurricanes work nicely as well. I love how the gentle glow lights up the vibrant amber glasses on the table too. Adding cozy candlelight to your surroundings extends the party ambiance into the yard and expands the whole alfresco experience. A tidy bow made out of jute twine keeps silverware and napkins together for each guest. At the center of the table, a macramé runner adds yet another layer of texture and acts as the foundation for the seasonal décor. Cozy candlelight set throughout the garden expands the ambiance of alfresco dining. There aren’t many things that are more romantic than beautiful, fragrant roses. Three small ironstone creamers hold petite bouquets of white roses with one symbolic yellow rose in each. The yellow roses represent happiness and friendship while the white roses express remembrance. Family, friends and memories are an integral part of Thanksgiving, and these roses symbolize how important new friends are while we call to mind Thanksgivings of days past. The amber glow given off by these vintage glasses brightens the whole farmhouse table while at the same time adds a gleam of seasonal color. A great way to keep things running smoothly on Thanksgiving is to plan ahead. 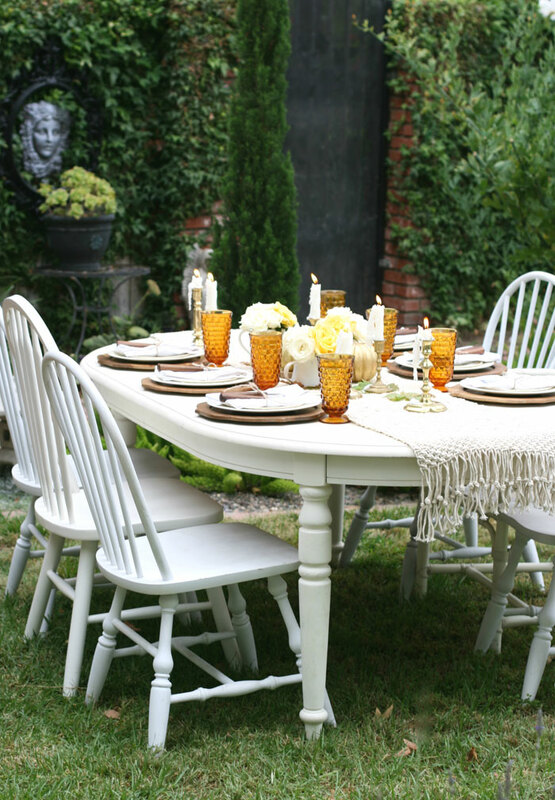 A few days before, lay your settings out indoors on the dining table so you can start formulating the look you’d like for your outdoor table. This way your plates, glassware, napkins and everything else will be ready to go on Thanksgiving morning, and then all you’ll have to do is transfer it outdoors. Enlist the help of friends and family members who may be eager to lend a hand. After all, the key to hosting a successful Thanksgiving gathering is being organized, that way you’ll stay calm and enjoy the day.